Twenty-seven-year-old Kaci Lickteig, who hails from Omaha, Nebraska, took the Rocky Raccoon 100 Mile by storm over the weekend, finishing second woman and less than four minutes behind winner Nicole Studer. In her first interview with iRunFar, Kaci talks about her running background, what her strengths and weaknesses are, and where we’ll see her racing in 2014.
iRunFar: This is Kim Wrinkle with iRunFar and I’m with Kaci Lickteig, the second–place finisher in the USATF 100-Mile Championships yesterday at the Rocky Raccoon 100, and she has a ticket to Western States. Are you excited? Kaci Lickteig: I’m very excited. iRunFar: Was that the goal coming in—top three? Lickteig: Absolutely. It was the biggest goal. I’ve signed up for three of the Montrail series just to try to get into Western States. iRunFar: Tell us about your ultra history. You’ve run one ultra before or one 100 before? Lickteig: One 100, that was at Black Hills 100 this past year in June. Since then I’ve just been doing some 50k’s, 50 miles, and I’ve definitely enjoyed it. iRunFar: Was the 100 miles at Black Hills more difficult? Lickteig: Absolutely, a lot. It really prepped me for this to know that I can get through a lot tougher situations. iRunFar: How did you find the course? Were the tree roots a problem? Lickteig: There were sections that were difficult, but as long as you were just watching your footing and being really cautious, you could get through it. iRunFar: Omaha, Nebraska, is typically cold this time of year. Yesterday was 63, 69. Did the humidity or the heat bother you at all? Lickteig: It actually did. I was really surprised at how much the humidity really hit me, but I just adjusted what I needed to so I knew that I could finish. iRunFar: Nutrition-wise, did you have any trouble getting liquids down or could you take some solids and everything with the humidity? Was it mostly a liquid diet for Kaci? Lickteig: I was able to eat cookies a lot, so I was eating the cookies. I took my Stinger gummies and waffles, so I could kind of go through those. Saltines were really helpful and then Gatorade throughout the race. iRunFar: Talk about your ultra history beyond hundreds. What have you done in the years leading up to this? The joke is, “She looks like she’s in high school still.” You’ve obviously been on the circuit for a little while; so talk about your running history. Lickteig: Last year was my first year of actual ultras, doing those; before I was more just marathons and half marathons, road races. Last year my first approach was Kettle Moraine to prep me for Black Hills because I signed up for Black Hills after the Moab races. I wanted to challenge myself for the first time and see if I could do it. Since then it’s been my beloved passion. I love them—the people, the atmosphere, the great volunteers—it’s just wonderful. iRunFar: Compared to marathons and the atmosphere at marathons, do you find it similar or are there some nuances? Lickteig: It’s a lot different. This is much more laid back. People are more for others than they are for themselves. It’s not about, “I’m going to beat you at this time.” It’s about helping others completing their goals. That’s more of who I am and definitely something I live for. iRunFar: If the conditions yesterday would have been as they are today do you think you would have run faster or was yesterday basically beyond your expectations in terms of time? iRunFar: Did you make your shoe choice based on the face it’s a flat course or did you stick with the same shoes throughout the race or did you switch at some point? Lickteig: I wore the Pearl Izumi N1 Trail shoes and those were perfect for the trail. They were light and just enough traction—no falls—yay! iRunFar: For Western States, will you actually go to the ‘training weekend’ over Memorial Day or will you see some sections of the course before you actually race? Lickteig: I will not. I won’t be able to with work, so it will be a surprise. iRunFar: Talk about your work. What do you do for work? How do you fit training in? Lickteig: I’m a physical therapist so I work in-patient with post-surgical orthopedic patients. Basically I do that all day for eight hours, five days/week. I train after work and make my weekends long runs. That’s about it. iRunFar: Is training mostly roads or are there some trails near Omaha that you run on? Lickteig: The majority, I’d say probably 95% of our training is roads, then there are a few trails in Omaha, but you have to drive to them. So it’s not so convenient when it gets dark so early, so it has to wait for the weekends. iRunFar: Any races between now and Western States? Lickteig: I’ll be running Lake Sonoma and Ice Age. iRunFar: Ice Age in Wisconsin? iRunFar: Best wishes between now and then. Nice to meet you. You might want to get used to these interviews; they might be steady and forthcoming with your performances. Congratulations. Lickteig: Thank you very much. Kim Wrinkle is a veteran of over 50 marathons (PR of 2:23:15 in 1982), an avid ultrarunner and fan, and a passionate outdoorsman. 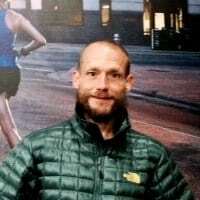 He teaches high school AP English and coaches runners at Rogue Running in Cedar Park, Texas. Kaci was being modest about her road running background as she did run in the US Olympic Trials Marathon and has a 2:44 to her name. Great to see such a down-to-earth runner mixing it up on the trails at 100 miles!